Posh Polishes: China Glaze Daisy Know My Name? This is okay to use, hard to apply and okay drying (3 minutes a coat). The formula is quite streaky and does require 3 coats and careful brushwork! Make sure you have plenty on the brush for decent coverage. The colour is okay but the formula is really poor. I was a bit fed up with this so I only swatched it. Wow, that shade so beautiful! Yellows are so difficult to work with, it can be so frustrating! The colour is great! When it comes to China Glaze, I often found out their neons were smudging and needed 3 coats. This one is bright and the rule is confirmed. A yellow that needed 2 coats was Miss Sporty from what I remember. 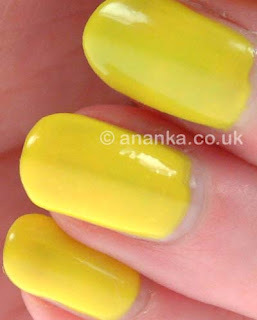 It's such a pretty and happy yellow, too bad about the formula..
Hi dear Anaka, time ago I bought a yellow nail polish by Pupa and I have the same identical problem you had with this yellow! Soon I'll prepare a post in which I'll show you this problematic nail polish...maybe it's a problem of the yellow pigment??? I didn't try it, but it is not good that it has not a good formula. It is indeed a striking shade! I like yellow!! Although maybe a bit more pastel. 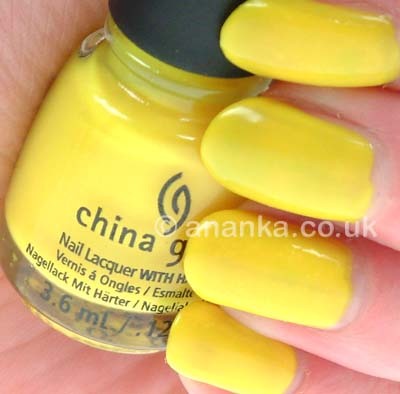 Yellow polishes are often tricky, it's a pity that also this one from CG is hard to apply. Thanks Marcela, glad you like the yellow. Some colours don't look great on my nails though!